Tuesday started with a surf check. After checking everything from Pacifica south to the Davenport Landing, we decided Davies would be the call. Everything else was pretty small. I was looking forward to surfing with Greg and his crew. They knew this spot well and would help me dial in that elusive left I couldn’t find yesterday. It was big and foggy. I padded out with my 9’4″Stewart. I wasn’t quite comfortable on my new Channel Islands yet, and didn’t want to be kooking it up in front of Greg’s friends. Half of the time we couldn’t even spot the cliffs on shore. I stayed a bit outside of the crew, just to be safe as I didn’t want to get cleaned up with my longboard. I was selective on which ones I took, and caught a few really fun waves. The left wasn’t working too well that day, but the head-high rights were plentiful. 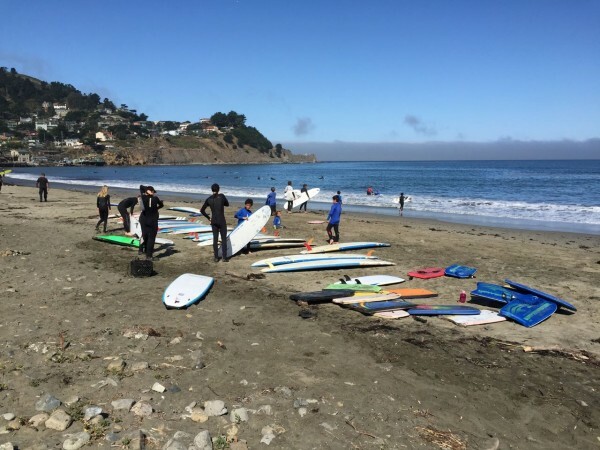 On the way back, we stopped at Lindamar Beach where Greg and Amy run the Surf Camp Pacifica, the best surf camp in the Bay Area. They’ve been running this camp for 17 years. Greg is an expert waterman, and Amy is… well, I’ll get to that in a bit. Time to get the bus looked at. Greg’s neighbor, Bruce, happens to own the best VW shop in San Mateo Country. Tassi’s VW has been a air-cooled expert since 1984. In this day when cars are run by computers, old VW’s tend to baffle modern mechanics. We decided to stop by my favorite coffee shop, the Salada Beach Cafe in Pacifica, where Bruce is known to spend most of his mornings. Sure enough, Bruce was at the counter enjoying his breakfast. He told me to drop by the shop and he would have his guys take a look my bus. A quick look underneath unveiled that the exhaust elbow/manifold joint was loose, and leaking. They resurfaced the flange and replaced the seals. They also found the CV Joints Boots were cracked and the Alternator Belt was aged. They replaced all the boots and gave me a new belt. They also fixed the latch on the engine cover which kept vibrating loose. The van was done in a few hours. If you are ever in the bay area and need your air-cooled VW worked on, go see Bruce.